Ankle sprains are by far one of the most common injuries, both in sport, and if you’re a bit clumsy like me, just walking normally down the sidewalk. 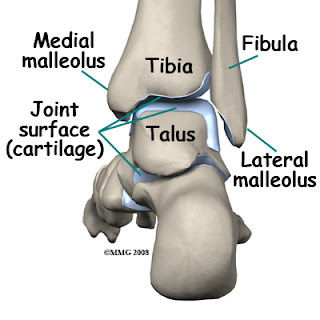 The lateral ankle sprain is commonly known as the “rolled ankle.” Basically your ankle rolls outwards over your foot and pain is felt on the outside of the ankle around the lateral mallelolus (the ankle bone that sticks out the most). Now, many of these pieces are still beneficial when it comes to recovery from a lateral ankle sprain. Some may argue that making an effort to decrease swelling takes away from the healing process because swelling is a normal part of healing. However, if there is too much swelling, this can limit the range of motion of the ankle causing an uncomfortable restriction that can alter the typical walking pattern of the individual in a weird way ultimately causing trouble in connected joints such as knees and hips. Therefore, things like ice and elevation can still be helpful pieces of the recovery puzzle. The part of the old school treatment process that has come under scrutiny is the rest piece. Often times when we are dealing with an injury, our first reaction is to rest or protect the area out of concern for hurting ourselves further. However, it is often a good idea with a rolled ankle to start moving (in short, light increments) as soon as possible so we don’t lose the range of motion. Now, we are not saying go pick up the heaviest barbell you can find and start working on your deep squats – that would be a bad idea. Overloading an injured joint is likely to cause pain and potentially worsen the situation. What is a good idea is to start making small, light, unweighted movements, such as pointing the toes then flexing the toes up to the ceiling. This would be done with your foot elevated (see old school rules above!) so it is only working against gravity rather than additional weight. Rest can still be good, but in shorter time frames. In other words, you don’t want to restrict yourself to crutches for 2 full weeks, but taking the time to rest the ankle between movements will give the healing process time to work its magic! The body is truly an amazing thing when you think about it, and healing (and the funky coloured bruising that can accompany it) is an important process to regain full functional ability. Of course, we always recommend that you come in to see your physiotherapist for an individual assessment as not all sprains are created equal. It’s also important that you rule out a potential fracture before following the above guidelines. If you have any questions, give us a call and book an appointment!